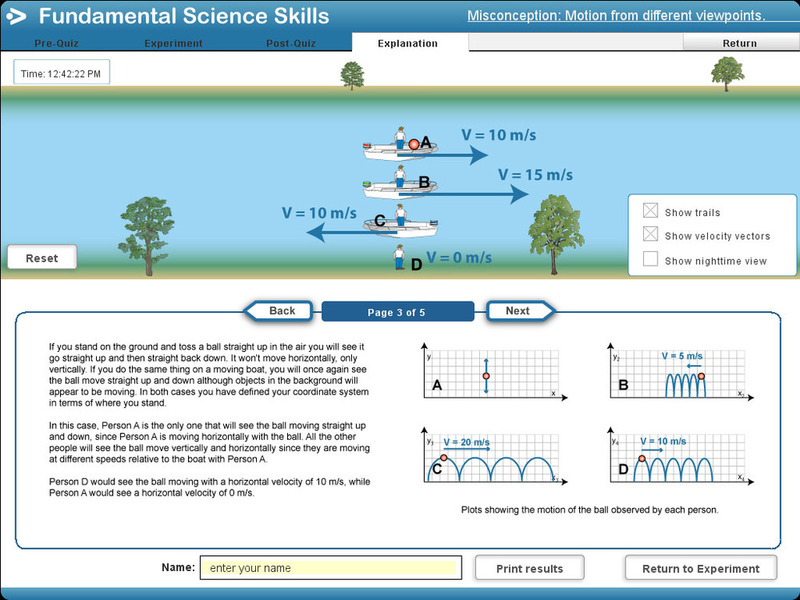 Fundamental Science Skills contains interactive learning modules that teach vital skills students need early-on in a physics or physical science course. 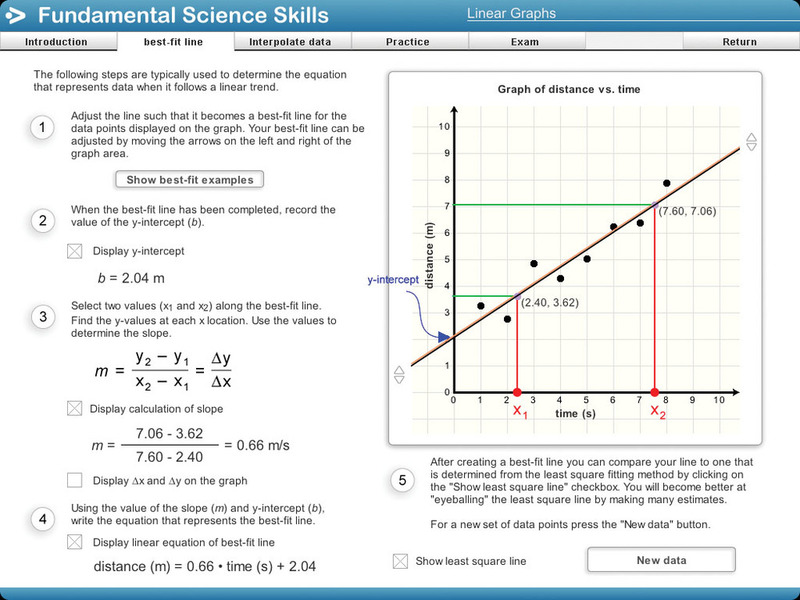 Presented with graphs of position, velocity, and acceleration plotted against time, students must setup an arrangement of sloping tracks so that a frictionless puck sliding on the tracks will reproduce the motion shown in the graphs. On the Exam screen, students try to obtain their best score by reproducing the motion graphs with as few trial runs as possible! 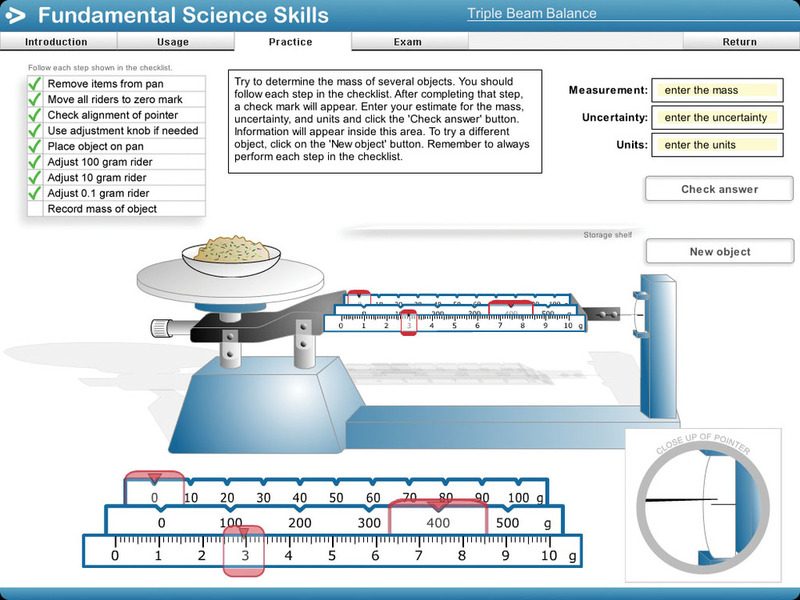 Students receive guided practice using a triple-beam balance. While massing various objects, feedback is given as to how well proper procedure is followed when zeroing the balance, using the riders, reading the mass and estimating the final significant digit. Students then proceed to the Exam screen where they’re evaluated on how well they use the balance to mass several objects. A ball bouncing on a moving boat is observed from several different reference frames. Students are guided through a pre-quiz to identify existing misconceptions, perform a series of investigative experiments, then take a post-quiz with feedback provided. Students gain experience drawing best-fit lines by comparing their line to one that is generated from a least-squares fitting method. The linear equation that represents the data is then determined. Interpolation and extrapolation of data are also performed. Students discover the process of how a scientific theory or model is formulated by means of a game. Rings are suspended from rods inside a sealed box, the location of the rings must be determined by withdrawing the rods. 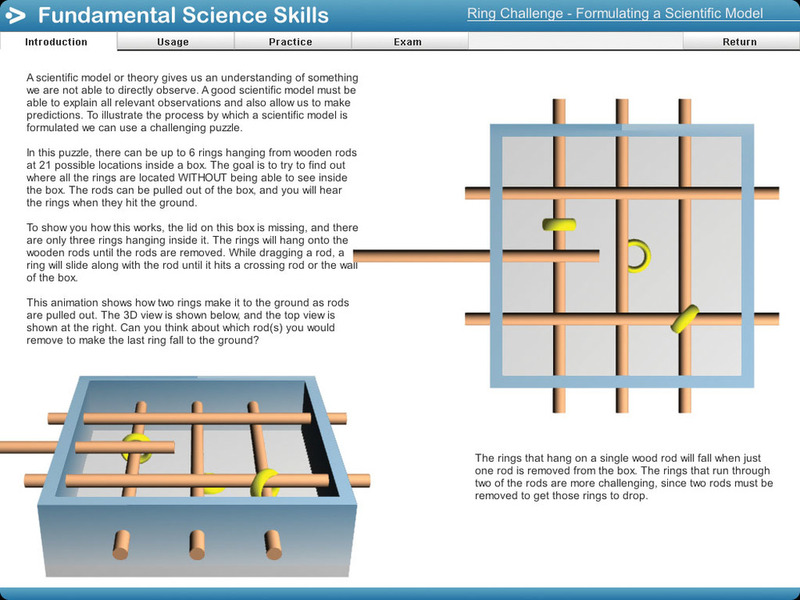 Without ever seeing inside the box, students assemble a ring-configuration model that explains their observations. Upon withdrawing rods in a different order or direction in future trials, students find their model must go through a series of modifications to explain new observations. This module is designed to help students attach physical meaning to distances that have wide ranging orders of magnitude, and understand what each power of 10 increase in distance actually represents. Students must determine various distances by going through a process of making initial estimates and then fine tuning their estimates based on feedback they receive. Students perform an experiment involving pucks being launched across a flat surface. Upon stopping they drop into the nearest bin creating a histogram showing distance traveled. Standard deviation is determined using a graphical method that is both simple and highly visual. An elevator accelerates upward (or downward), moves at a constant speed, then decelerates and comes to rest. The person's weight as seen on a scale is displayed along with an acceleration and velocity meter. 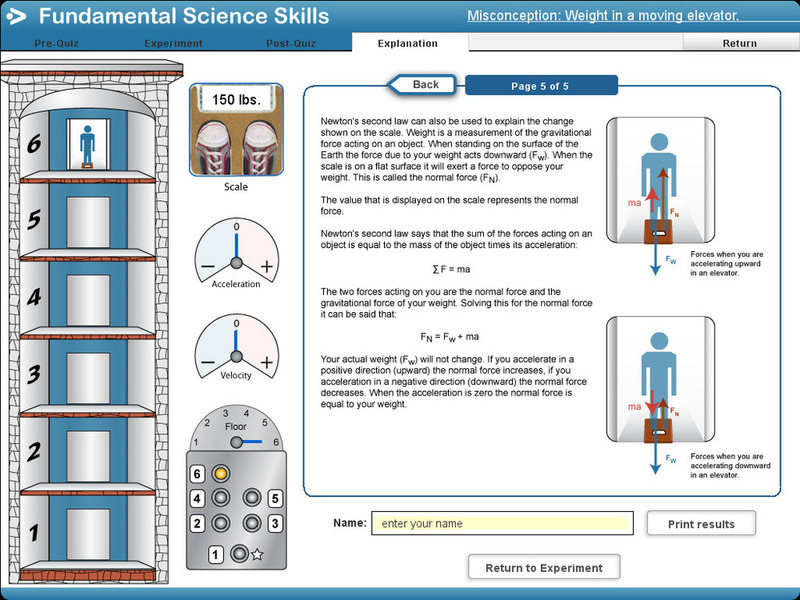 The Pre-Quiz, Experiment, Post-Quiz, and Explanation screens guide the student through the module. 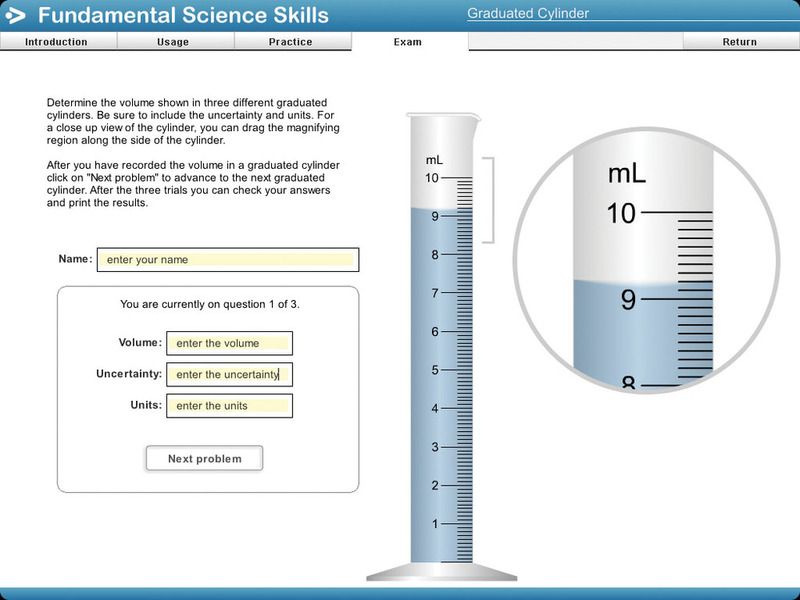 Using different types of graduated cylinders, students receive guidance and practice making accurate scientific measurements—using proper technique, reading scale to proper number of significant figures, and determining the uncertainty associated with the measurement. Sampling of learning modules, hover over image for description. Fundamental Science Skills is a unique program that utilizes the computer as an instructional tool to its fullest extent. The program contains interactive learning modules that teach vital skills students need early-on in a physics or physical science course. Each module presents an interactive self-guided lesson providing virtual one-on-one instruction. 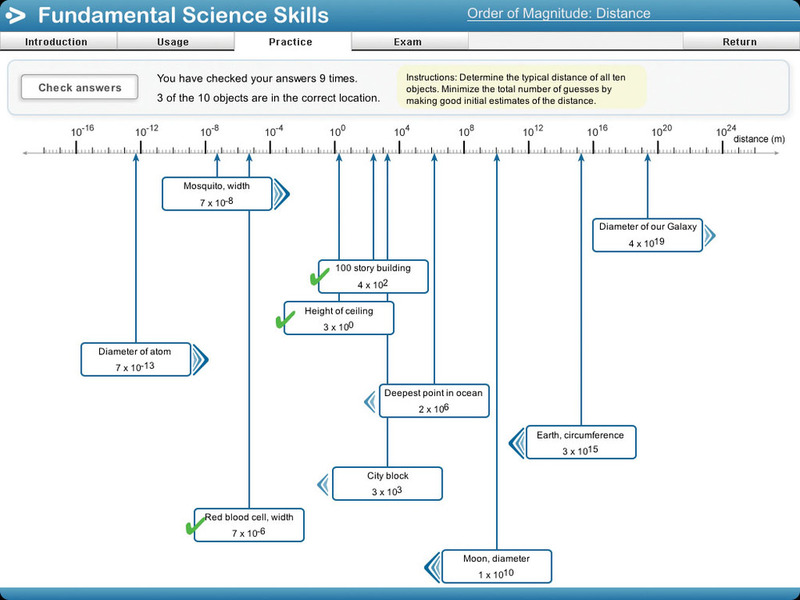 Topics include: measurement apparatus used in the lab, graphing skills, interpreting graphs, error analysis, understanding the process by which a scientific model is formulated, developing an intuitive sense for the magnitude of various physical quantities when powers of 10 are involved, and common student misconceptions. The topics were selected based upon instructor input of basic skills students were in most need of improving and basic areas where students lacked understanding. 1) Introduction Screen: A thorough introduction to the topic is given so that no prior instruction is necessary. 2) Usage Screen: Students are taught the skills required to meet the learning objective along with information on how to use the interactive simulations. 3) Practice Screen: Students practice with graphic-rich interactive simulations that provide immediate feedback on how well the student is performing. Students are presented with many different practice opportunities allowing as much practice as necessary to master the objective. 4) Exam Screen: The on-screen exam tests if the student fully understands and has mastered the learning objective. The exam is automatically scored with the results shown on-screen along with the option to print-out the results for submitting to the instructor. Exams use randomized data so the instructor can be assured the student's work is not plagiarized. The Common Student Misconception modules have a slightly different structure. Students are guided through a pre-quiz to identify existing misconceptions, then perform a series of investigative experiments, and finally take a post-quiz with feedback provided. • What is Your Weight in Space? • Are Heavier Sleds Faster? • Are Shorter Paths Faster? • How Quickly Do Things Fall? Unlimited Site License allows an unlimited number of computers to run the software at one site, student take-home privileges are granted with this license only. Distance Learning License is priced the same as the Unlimited Site License. Web Browser: If your school has a subscription to Frame, the software will run on iPads, Chromebooks, or any web browser. Preview the full version of Fundamental Science Skills for 15 days—completely free with no obligation to purchase. Fill out and submit the Preview Request below to receive the download link and 15 day access code via email. Thank you for requesting to preview Fundamental Science Skills. Your request has been successfully submitted. You will receive an email containing download information within 24 hours. Please don't hesitate to contact us with any questions.